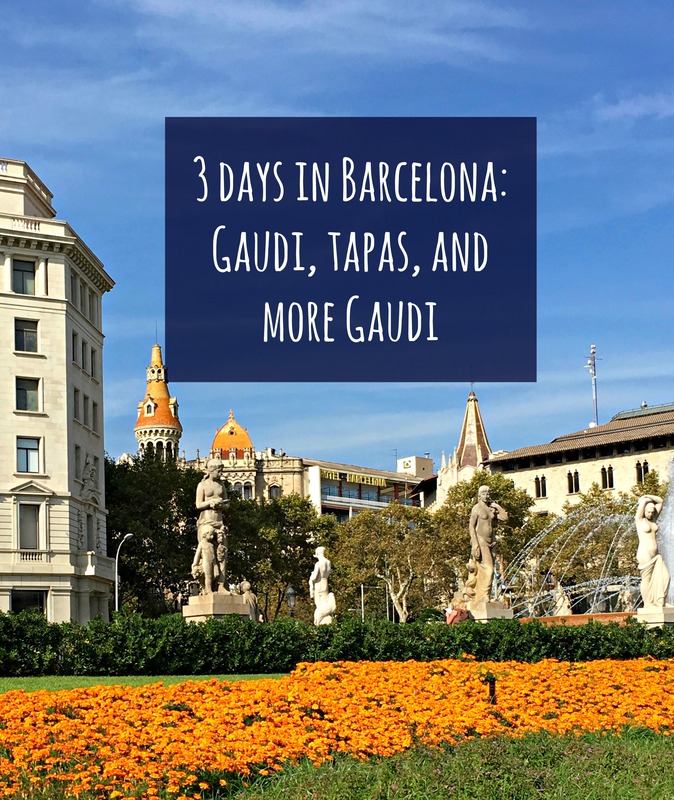 3 days in Barcelona: Gaudi, tapas, and more Gaudi – RLB Ink. After three awesome days in London, we were off to Barcelona! 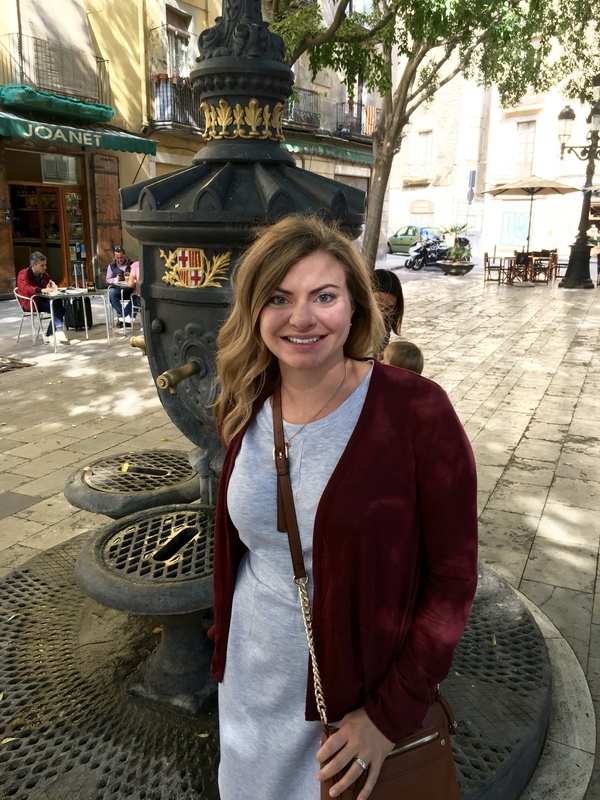 I’ve wanted to go to Spain FOREVER, so I was so excited to soak up the culture. I speak enough Spanish to get by and I love putting it to use. (Note: They actually speak Catalan, a variation of Spanish.) We took a quick, easy flight via Vueling and were greeted with a Blacklane driver in the airport*. He grabbed our bags and we were on our way! 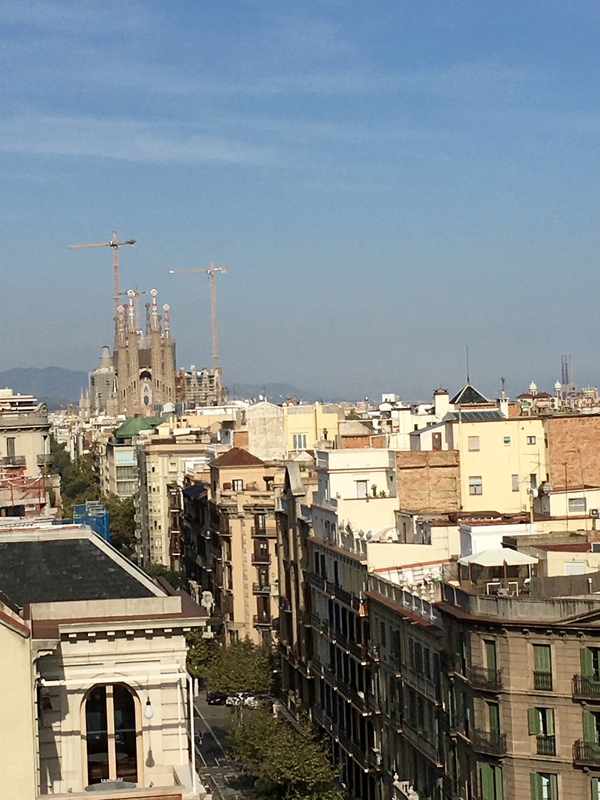 We settled in to our Airbnb in el Born, a neighborhood that was described to me as the “West Village of Barcelona” by my friend Jess. It had the cutest shops, restaurants, and narrow, winding streets. Our Airbnb hostess, Lula, took the time to map things out for us so we were easily able to figure out where to go. We set off on foot to La Boqueria for lunch. Talk about a hit to the senses. 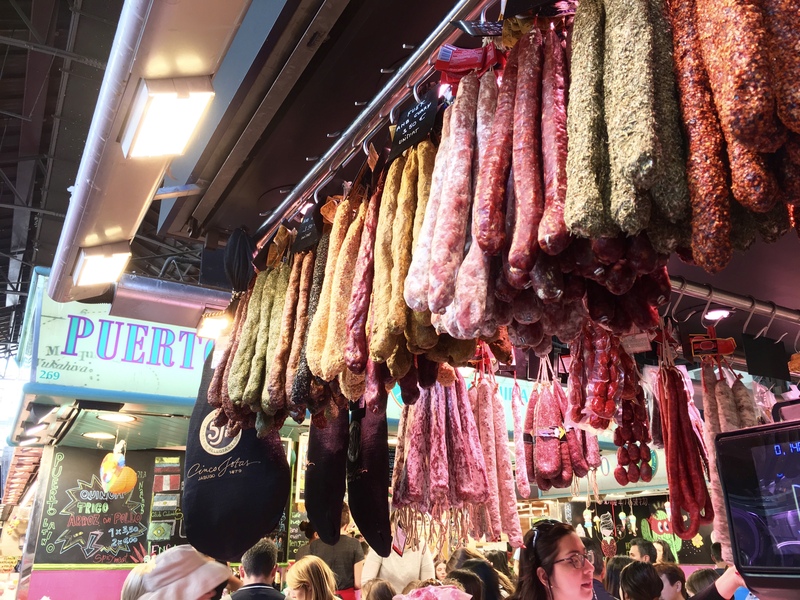 The market was packed and smelled of amazing meats and cheeses. We spent at least 30 minutes browsing the stalls until we settled on a fresh juice, jamon and cheese, cod fritters on sticks, and chicken with feta and olives. It was only €12 for everything and it was all so delicious. After lunch, we went north up La Rambla, which is a super touristy strip. I’m sure it would be more appealing when there are fewer people, but the crowds made it tough to enjoy. 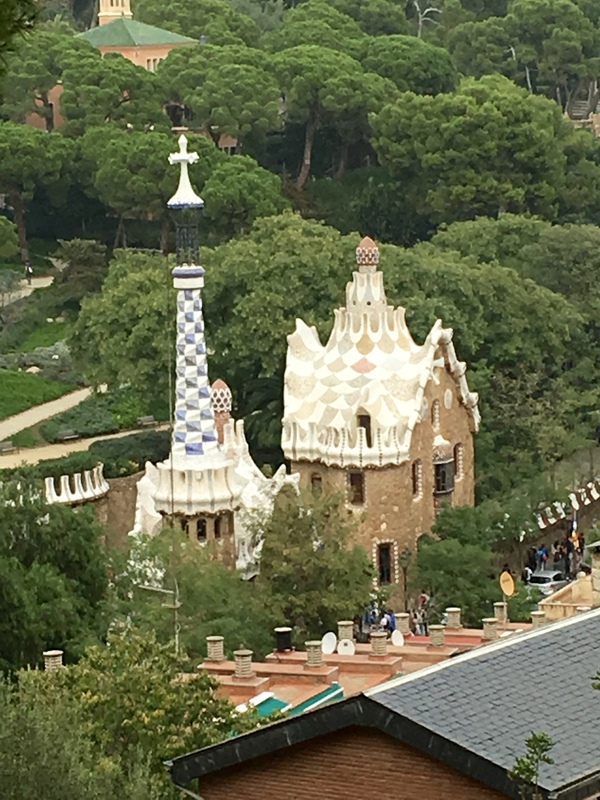 It is where many of Gaudi’s homes are, so we were able to see those. 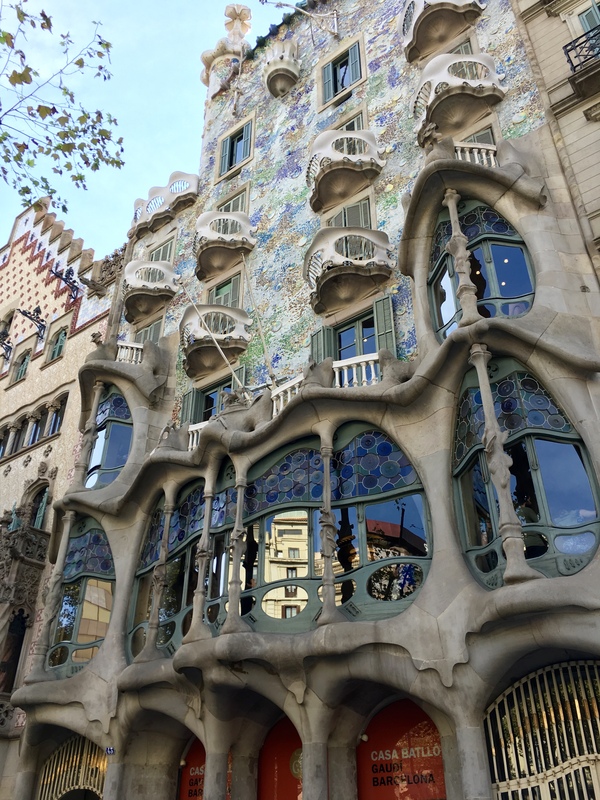 We stopped to admire Casa Batlló but the line was pretty long. 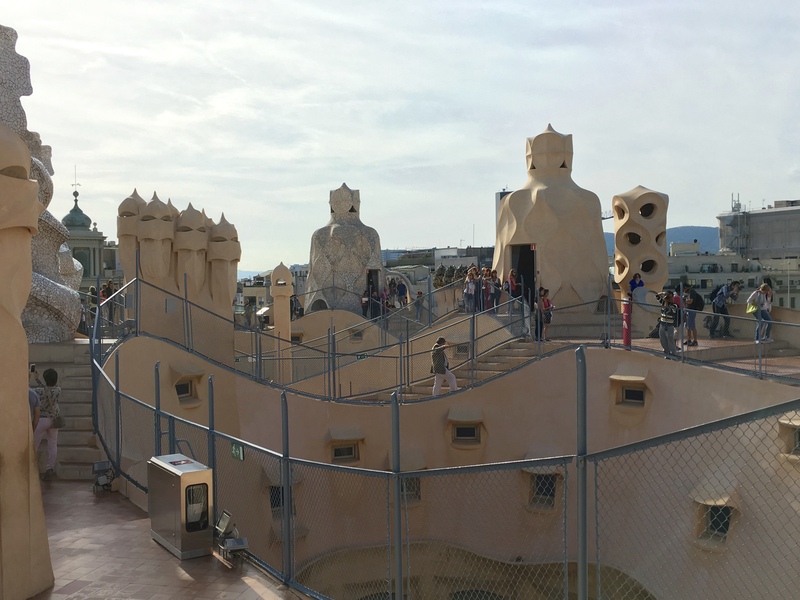 We skipped ahead to Casa Milà (aka Casa/La Pedrera) and were able to get in pretty quickly. It was actually a home commissioned by a local businessman. The stone exterior is a wave pattern, which extended to the interior. We toured one of the apartments and were able to go on the roof, which is dotted with skylights and chimneys (which look like they have faces). 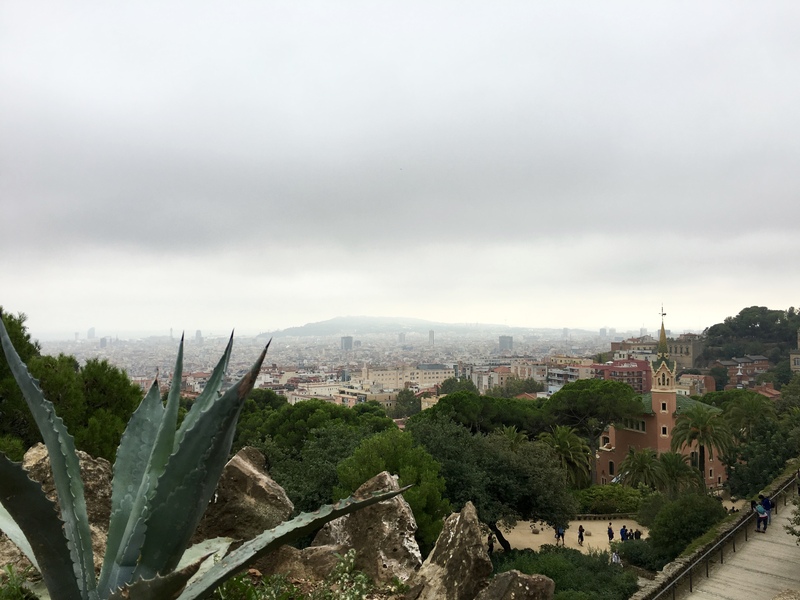 There were amazing views of the city, including Gaudi’s Sagrada Familia. You see the faces, right?! 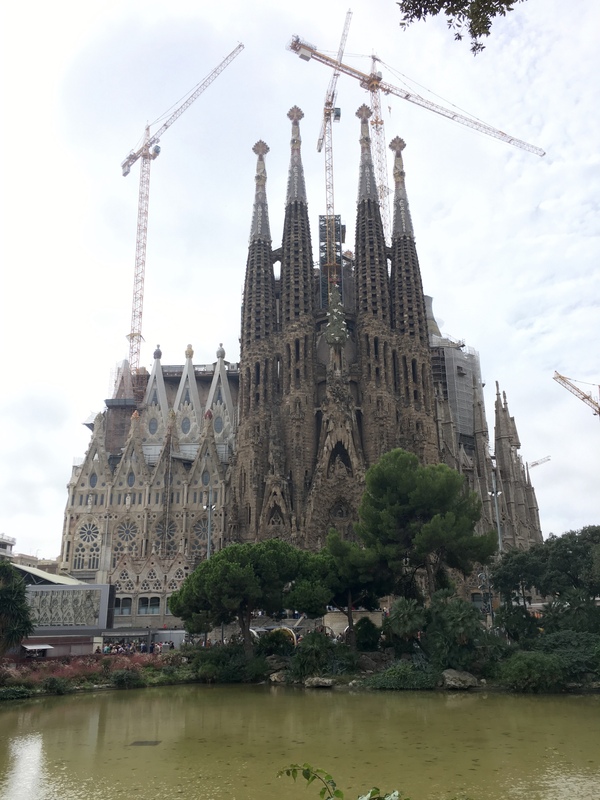 La Sagrada was our next stop, but we didn’t know that we needed to schedule a time and buy tickets in advance. We took the long way back to el Born to partake in some tapas time. (We passed kids playing soccer — I mean, futbol — and walked through Parc Nord.) We stopped at Calily, which had pretty good food but the red sangria was sickeningly sweet. We went back to the apartment to rest before dinner and then went to Bon Sant for dinner. There was an amazing eggplant with goat cheese and delicious pan con tomate (which we ordered almost everywhere), but I can’t find a website for the restaurant to share it. After dinner, we stopped at Santagustina for drinks. 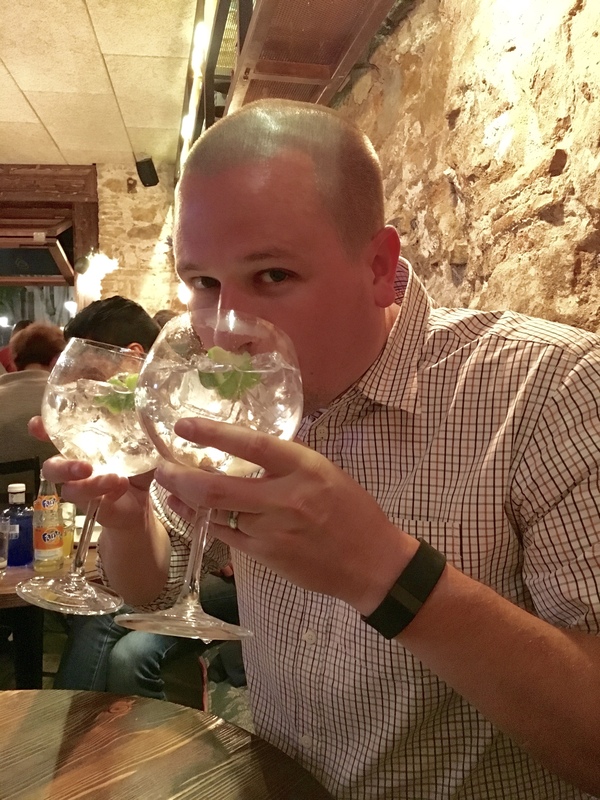 We both ordered gin & tonics, which Steve had been told were large, but these were MASSIVE. Truly, they were like fishbowls. I couldn’t finish it, but if I had, I would’ve been hammered. So Sundays in a Catholic country are a little quiet, we quickly discovered. 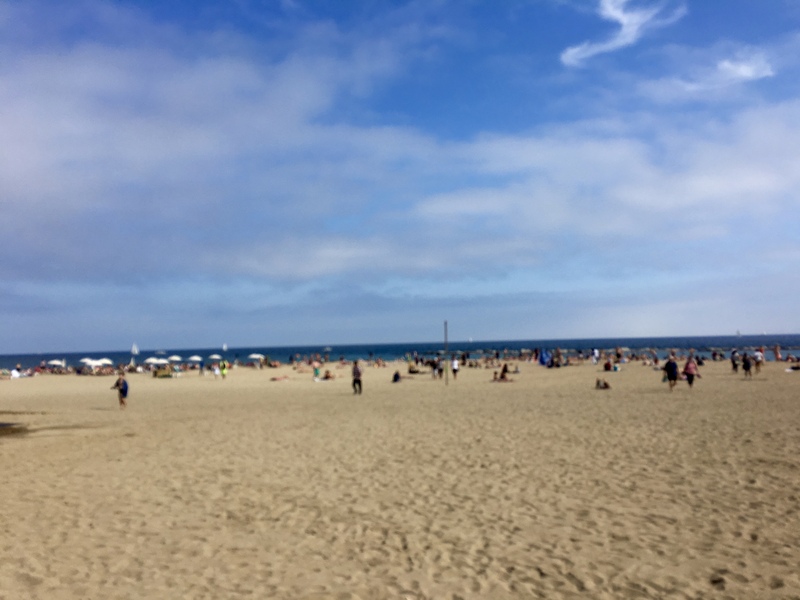 We started our day in Barceloneta, the little beach neighborhood along the water. I really wanted to go to Can Majó (per Jess’ recommendation), but so did everyone else. We couldn’t get a seat for lunch and they were closed for Sunday dinner and on Mondays. We ended up at La Vinya del Mar, which wasn’t the best. Service was extra slow and the food wasn’t that great. When you only have a few days in a place, it’s a real bummer when a meal isn’t very good. 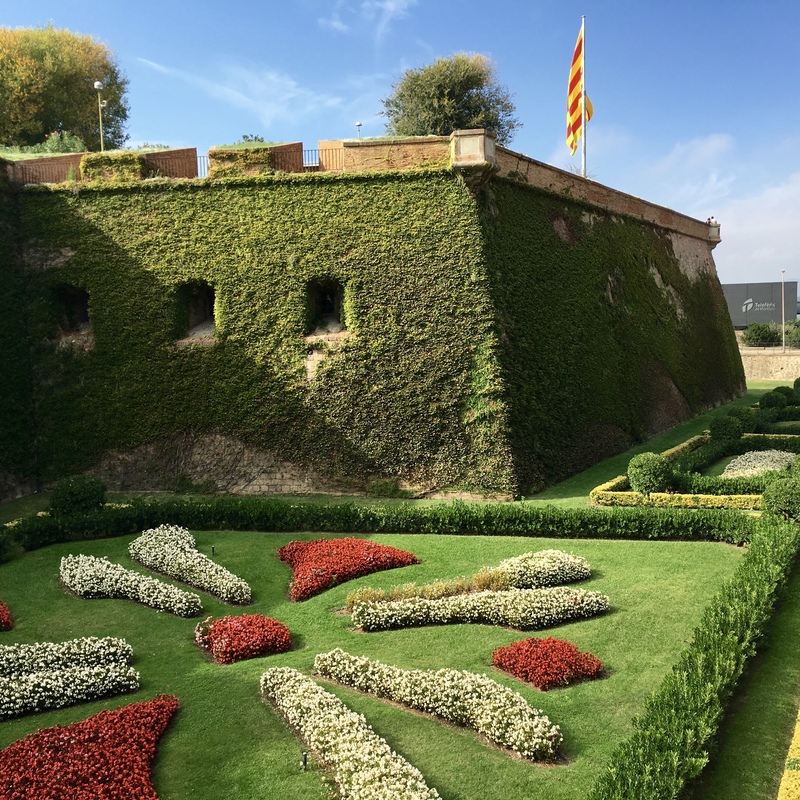 After walking along the beach, we grabbed a cab to head to Montjuïc (“Jew Mountain”). I asked (in Spanish) the driver if he spoke English and he said he could speak a little. I managed to get us to the castle at the top of the mountain using almost all Spanish! (There is also a lift that will take you up.) The castle was really awesome (and, for some reason, they were waving the fee for Americans!) and had an amazing view of the city. It was once a prison, so just like in London — numerous executions. When you leave the castle and walk down the mountain (on a sidewalk), you pass several gardens designed by Joan Miró. They’re weaving, winding mazes of trails and flowers that lead to the Estadi Olímpic Lluís Companys, the stadium that housed the ’92 Summer Olympics. It was amazing to think about the athletes who competed there, and it was another awesome view. 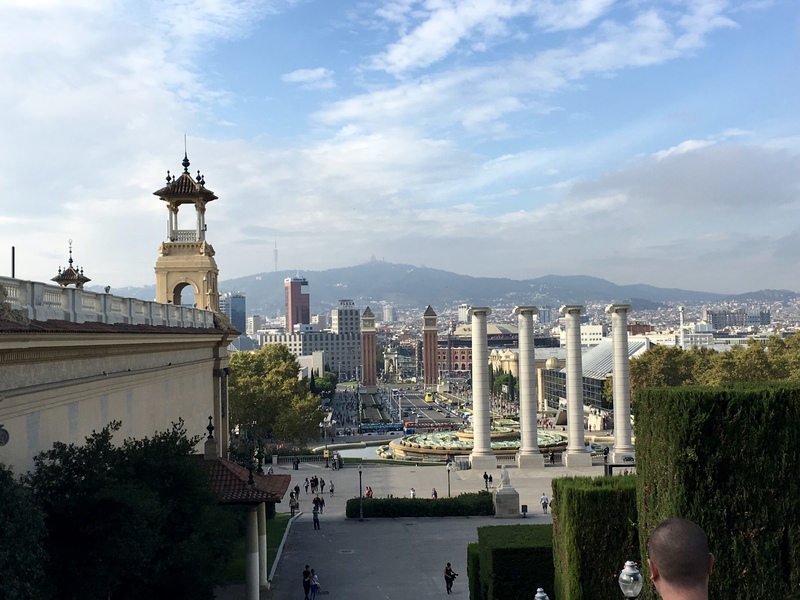 When you get to the bottom of the mountain, you end up at Plaça d’Espanya, the most famous square in Barcelona. 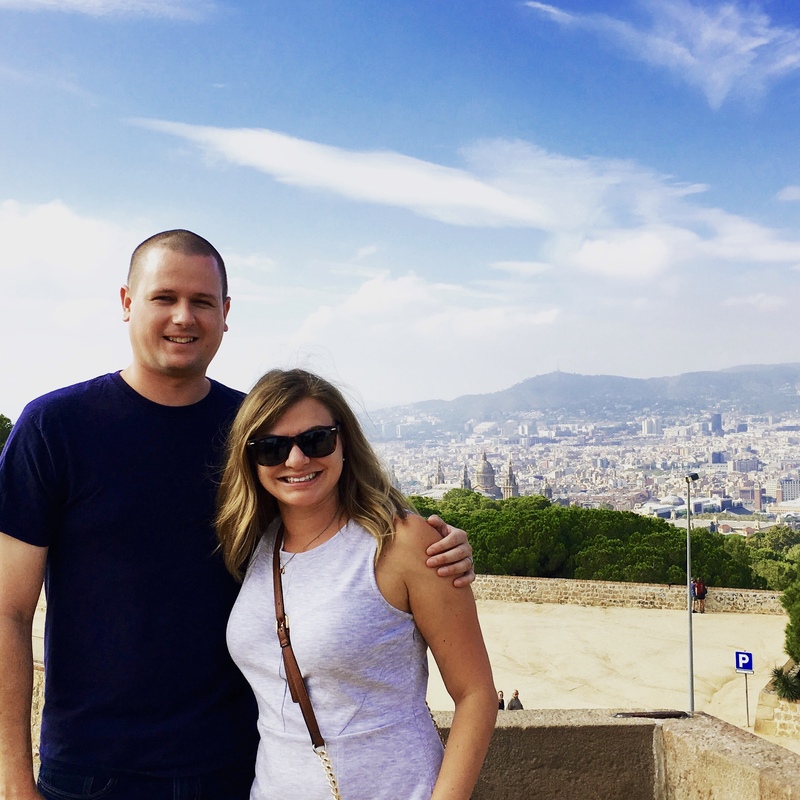 We were pretty far from el Born and spent awhile trying to get a cab (no Uber in Barcelona), which was frustrating. 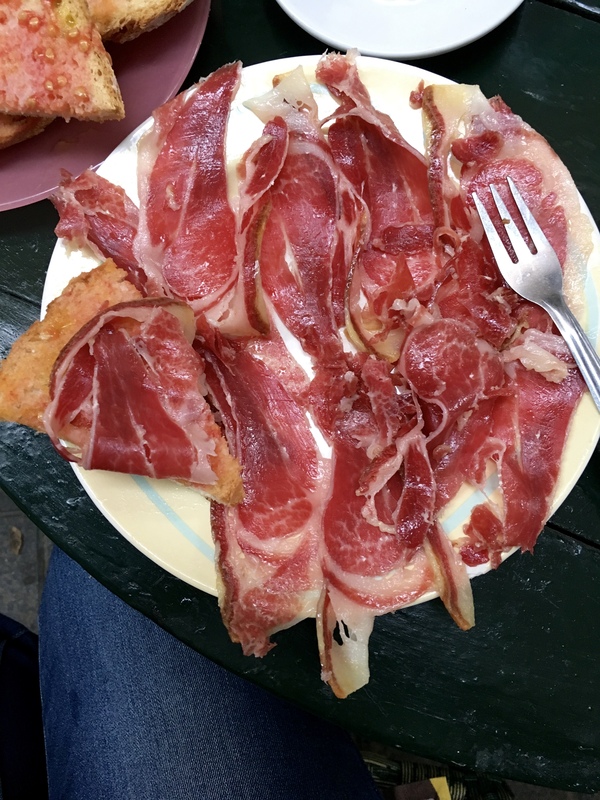 We were so hungry and immediately hit Euskal Etxea for tapas. They (and other places) use the toothpick method for tapas. It’s basically a tapas buffet and you keep the toothpick from each tapa. When you’re done, the waiter counts them and tallies the total. 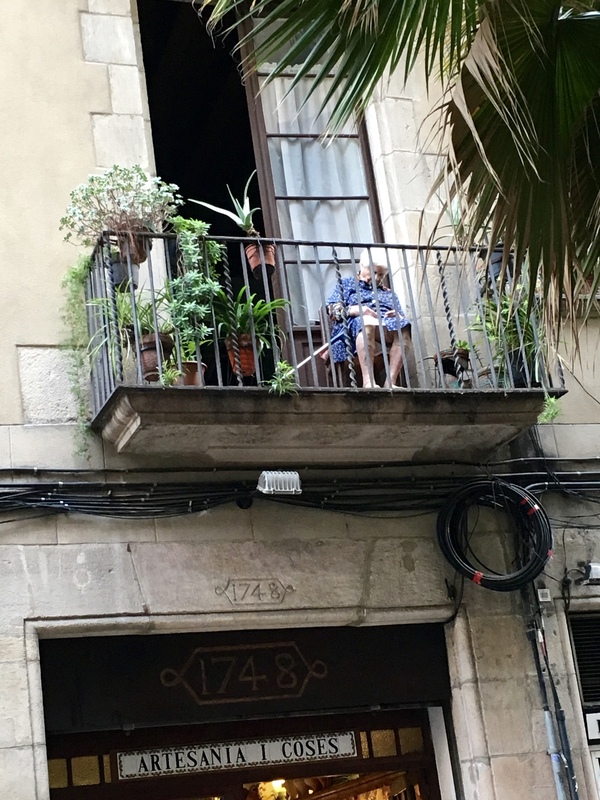 While we ate tapas, this little woman watched everyone pass by from her balcony. Then she fell asleep and kept nodding to the side. I was so worried that she’d fall. After some rest at the flat, we ventured out for another very late dinner. We stumbled upon Mercat del Born, a cool former market that is now a museum that tells the history of the Catalan state. We then went to Taverna del Born and managed to snag an outside table, which was pretty tough when it was about 70 degrees in the evening. Again, not the best dining experience. The food was fine but the waiter was really rushed and the most obnoxious, loud (American!) family was seated next to us. I did have a really, really good ricotta dessert with honey and walnuts. 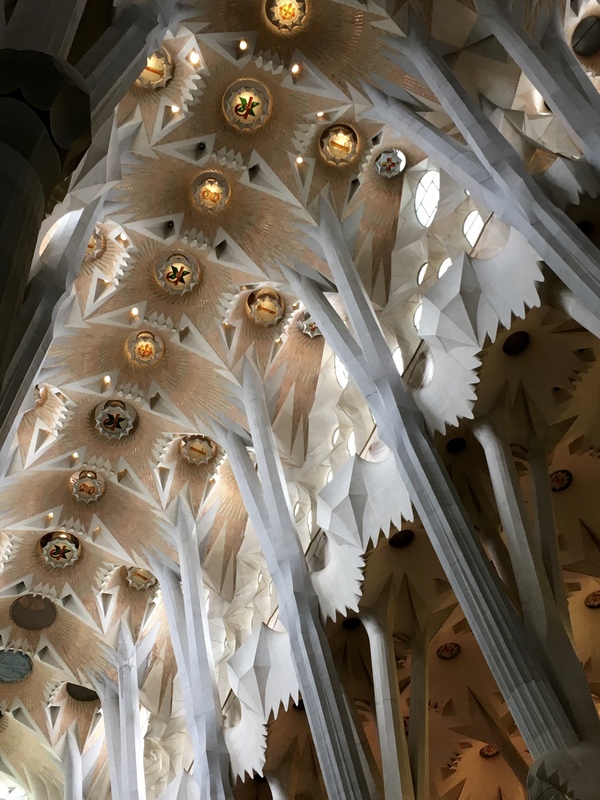 We had tickets to visit Sagrada Familia at 2:15pm, so our day was a little planned around that. 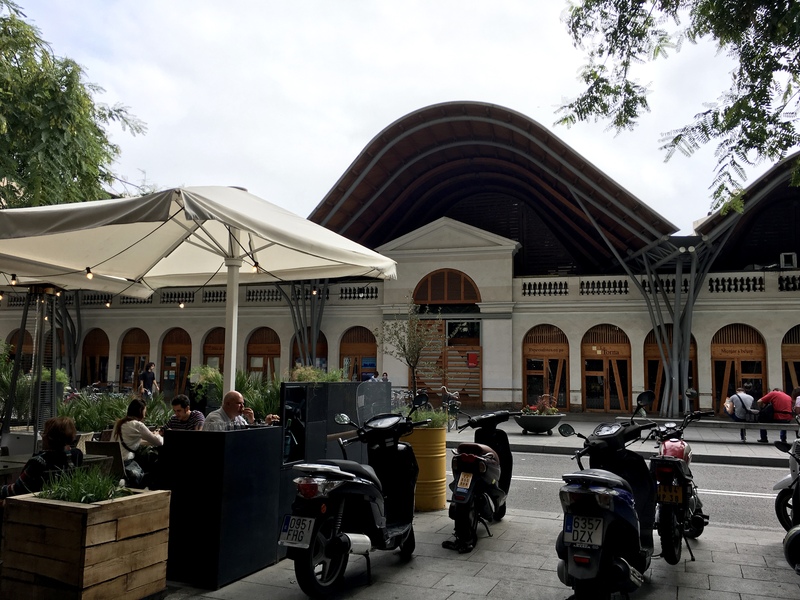 We started with an attempt to visit el Mercat de Santa Caterina for lunch, but it was closed. Oh, you know that guy, Columbus? Well, he’s kind of revered there and that Monday was Columbus Day. #FAIL. We settled for Orio Gastronomia Vasca, which had a view of the market and the toothpick tapas. 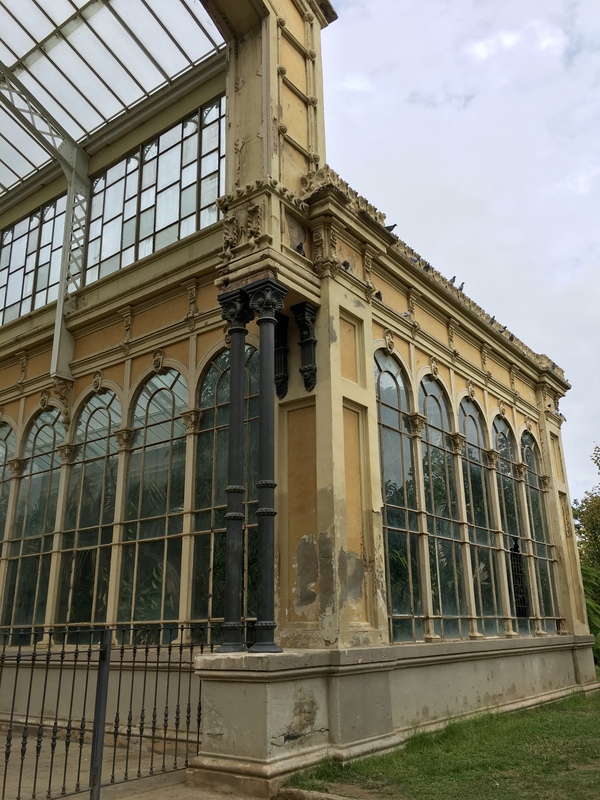 There is a beautiful park, Parc de la Ciutadella, that borders el Born, so we walked through it after lunch. There were beautiful old buildings throughout the park that I loved. Tickets in hand, we were off to Sagrada Familia. Since it was Columbus Day, the towers were closed, but at least we could get in to the church. Who could actually pay attention in church w/this? I mean, wow. Steve and I took so many pics and spent so much time just gazing up. The DETAIL in the space is unbelievable. To think that someone could fathom and then build it is remarkable. Pictures don’t remotely do it justice. There’s also a small schoolhouse and museum on site. We got to the edge of the park and were about to turn around when an old gentleman walked up and motioned for us to follow him for a better view. (He only spoke Spanish, but I could interpret most of it.) Being wary of pickpockets, we tried to turn away, but he was persistent. We let him walk ahead of us and, like he said, just a few steps away was a stunning view. He also handed me flowers (and told us that he wasn’t going to rob us) and then pointed out another location with great views. He was just a nice old man spending his day strolling in the park. After a long walk back to the ‘hood, we were famished and grabbed tapas at Casa Paco. Dinner on the last night was at Saboc, where the menu was arranged by heat — raw, cooked at X degree, etc. I loved the quinoa salad with nuts, coriander, mint and tzatziki sauce (and I’m going to figure out how to make it!) and chicken with truffled brie quesadillas. (We ordered the quesadillas twice!) After not the best meals ever, we really liked this one and were happy to leave Barcelona on that note. 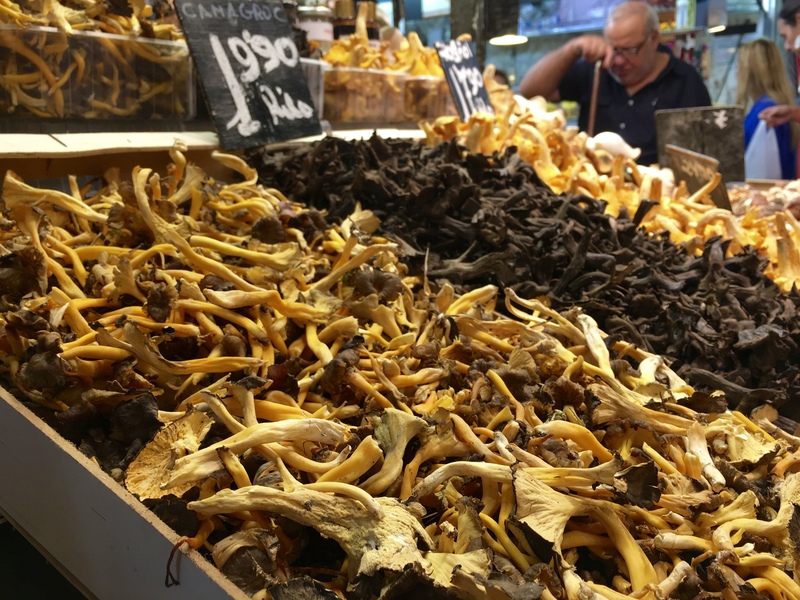 Don’t miss La Boqueria! We forced ourselves to try new places, but we would’ve happily eaten there every day. Embrace the later eating times. We quickly adjusted to tapas in the afternoon and dinner at 10pm and miss our daily tapas time. Enjoy the nightlife if that’s your thing. It’s not as much for us, but that’s definitely what Barcelona is known for. 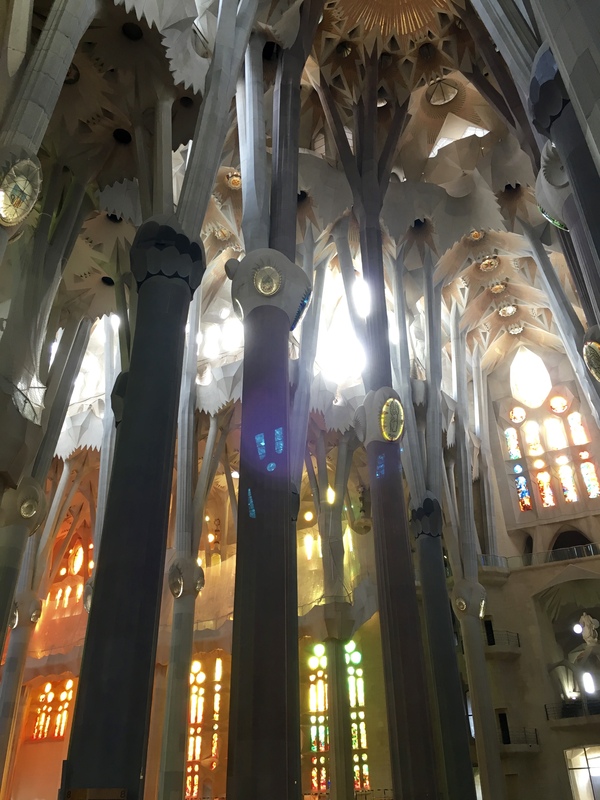 Buy tickets in advance for big sites like Sagrada Familia and Park Güell and the Picasso Museum. Avoid Sundays unless you want a really low-key day. A lot of shops and restaurants are closed, so it’s hard to get the true vibe. Barcelona was interesting. I’d absolutely go back and would love to spend more time in the city, but it wouldn’t be the first place I’d choose. I guess I like more of the charm than the grittier feel of Barcelona. 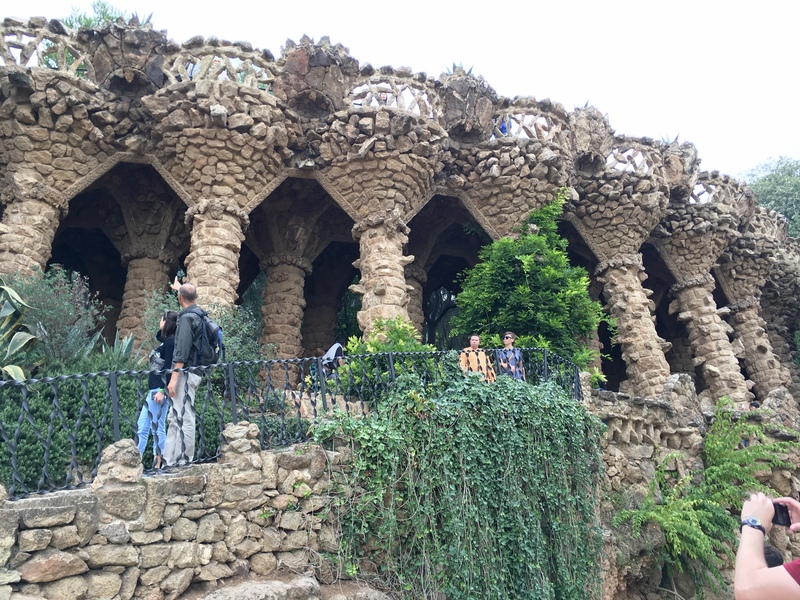 I also just don’t partake in nightlife to the extent that you likely should in Barcelona. That being said, I think because of the Sunday and holiday, we didn’t get the full experience of the city and I’d like to see more. And I need more pan con tomate. *Blacklane graciously offered me ‎€150 for transportation in Europe. It was SO nice to know that someone was waiting for us after each flight. Opinions are all mine (and Steve’s).